I talk often about the importance of having the right tools for whatever job you want to do. At PartyPlanDivas we talk about tools like business cards and social media pages. Mechanics, doctors, hairdressers – everyone has tools that make their job easier. I have learned in the last few years that having the right “tools” in the kitchen makes getting THAT job done a whole lot easier too! As someone who has only recently really started learning how to cook (seriously) I have learned that you can create restaurant-quality meals at home with the help of people like Independent Pampered Chef Consultant Kim Solko and her incredible line of kitchen tools! 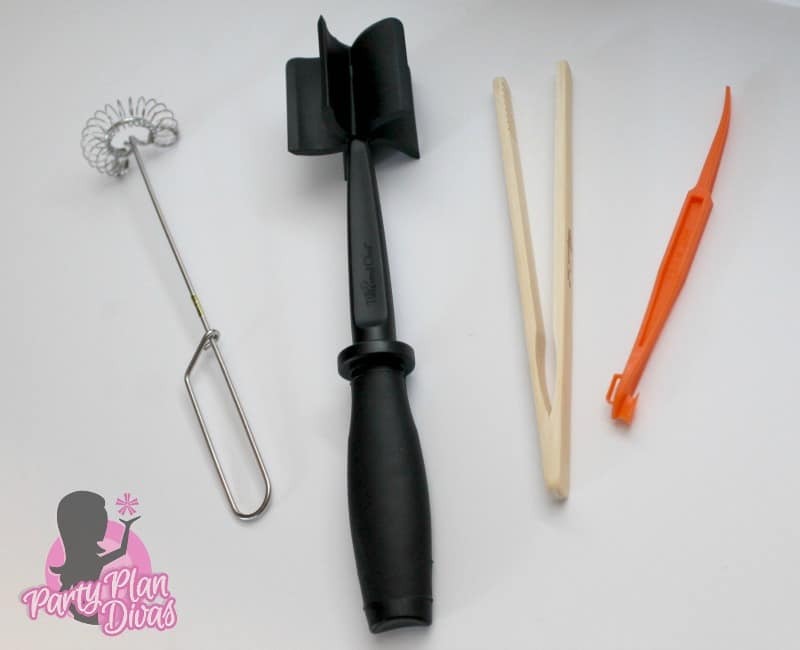 Kim sent a little “must have tool set” from Pampered Chef for inclusion in this year’s Christmas in July Gift Guide, and after using them for the last month, I wonder how I got anything done without them! meaning less to clean up! The Mix N Chop is great for breaking up foods you are cooking like hamburger meat or eggs, and since it is made with sturdy nylon it can get in to the corners of your pans with no risk of scratching. The Toaster Tongs are just excatly what they sound like – I can not tell you how many time I have burned my hand getting something out of the toaster or toaster oven! These are super easy to use and grab whatever you need without the fear of burning! My girls have used these every single day since we got them! The last tool has really become my favorite though. Living in The Sunshine State we eat a LOT of citrus – and the Citrus Peeler is just awesome. It makes peeling your favorite citrus a breeze and with no mess! My 10 year old has become a pro at peeling and oranges, tangerines, grapefruit and more! Pampered Chef has been a leading direct sales company for more than thirty years. Their mission to bring families together over great, simple meals has resonated with thousands of consultants and millions of customers worldwide. As a Pampered Chef Customer you know you are getting the best quality from a great family-centered company. As a Hostess you can earn incredible rewards be sharing the products with your loved ones. You can even join Kim’s team and help spread the mission of making meal time easier for families to spend time on what really matters. Check out Kim’s website to learn more about how you can get involved with Pampered Chef!